The all-in-one video editor "Vidholic" is now available! It's not only packed with powerful video editing features, but also includes a vast collection of free video editing materials! It's simple and user-friendly, with just a few taps you could create a true masterpiece! Regardless of your age or preferences, Vidholic is the only tool you need to become a strong player in all social media platforms! With Vidholic, becoming a YouTuber is no longer a dream! 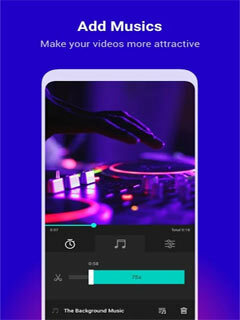 Furthermore, our two core features Video Grid and Music Video provides you with more than one way to edit your videos! More interesting and more fun, only in Vidholic! • Templates: 300+ collage templates with adjustable template height/width, where you can grid up to 4 videos! • Ratio: Supports the aspect ratio of various social platforms. Instagram Story's 9:16, square 1:1, 3:4 and many more aspect ratios to choose from. • Video order: Play videos in sorted order or all at once. Great for editing birthday videos! • Backgrounds: In addition to the current trending backgrounds, there are also over 400 beautiful background templates for you to choose from. Make your creations sparkle! • Text: Countless fonts, text borders, colors and shades. You can even adjust the transparency of the texts! • Stickers: 500+ stickers, ranging from flowers, emoticons, festive themes, beautify, accessories and so much more! • Border: Various border themes that are adjustable in size, so they could fit perfectly on your edited videos! • Photo Collage: Supports still and live photo collage creation, make a story from your photos! 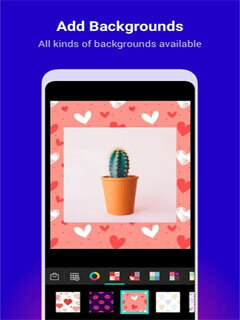 • Edit: Edit your photos' brightness, contrast and saturation, as well as trimming tools and filters to help you create eye-catching photos. • Transition: Supports 6 different transition effects, add cool transitions between each photo! • Edit: Have fun with tools such as layout, cropping, mosaic, blur, graffiti, and other editing functions. • Filters: 100+ filters including vintage, beautify, pink, black & white, and many more! • Blur: Add blur effects and adjust the degree of blur on your photos! • Border: Adjustable photo border size, including tools to curve the corners. Countless new stickers, backgrounds, filters updated every week.